Barbra O'Neil Chrisley was born on December 16, 1931 in Calhoun Falls, South Carolina. He was a local high school star playing with the Calhoun Falls Clippers leading them to a 1950 State Championship. In the final game Neil as he had become known, hit a HR to help lead his team to the title victory. The tall six foot three outfielder also played Football & basketball in high school One week after his high school graduation he was signed by the Boston Red Sox & had batting practice with Ted Williams. 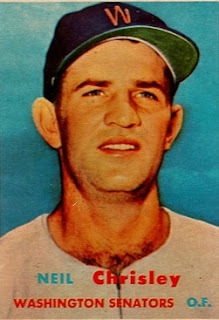 He had a long minor league career, getting traded to the Washington Senators organization in 1955. Over the years he played in the Mexican League where he caught a dangerous virus, in which he lost 15 pounds. He also played winter ball in Cuba the following winter during the dangerous period when Fidel Castro took over power of the country. 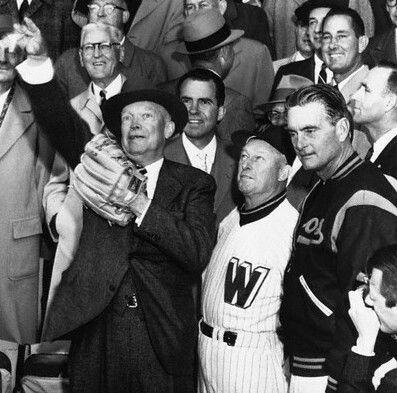 Chrisley began 1957 with the Senators big league club, catching President Eisenhower ceremonial first pitch to start off the season. He made his debut as a pinch hitter for Camillo Pasqual on April 25th, in the 11th inning against the brand new Baltimore Orioles club. He singled in that at bat but was soon back in the minors. The rest of the year he batted .343 (second in the league) with Indianapolis in AAA, making it back to the Senators for the 1958 season. He hit his first career HR that May, as a pinch hitter against Bob Turley & the A.L. New York team, in the Bronx & hit two more HRs in his next three games. Unfortunately he only batted .215 with 5 HRs in 105 games on the season & was traded with Rocky Bridges and Eddie Yost to the Detroit Tigers for Reno Bertoia, Jim Delsing and Ron Samford. 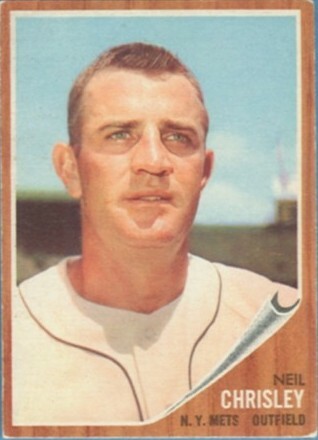 He became a reserve outfielder & pinch hitter the rest of his career, having his best season in 1960. In 1959 he hit a career high 6 HRs but only batted a weak .132 in 106 at bats. The next year he hit .255 with 5 HRs & 24 RBIs in 220 at bats, posting a .981 fielding % in the outfield. In a game against his old Boston teammates, he singled in the first inning off future Mets pitching coach Bill Monbouquette. It was the only hit Monbo allowed the rest of the day. At the end of the season he was drafted as the 44th pick of the Los Angeles in expansion draft but was returned a few hours later. He was traded to the Milwaukee Braves where he saw action in his last 10 MLB games in 1961 going 2-9 as a pinch hitter. In October of 1961 his contract was purchased by the expansion New York Mets, & he did attend the clubs very first Spring Training making him an original Met. In at least one game he made headlines by getting three hits in a game against Washington. Even though Chrisley still couldn’t make the ’62 Mets squad out of Spring Training, he did get himself on a 1962 Topps Mets baseball card. He was returned back to the Braves on April 2, 1962. Chrisley also came in fourth place in the first annual players Bowling tournament, competing against 64 other major league players from various spring training camps that March. 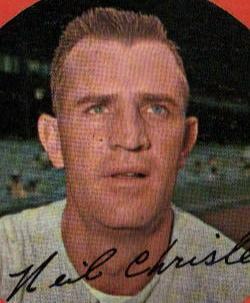 Chrisley went on to hit 60 plus HRs in his final three minor league seasons, finishing his playing career in 1964 with a .286 minor league average In 302 major league games over five seasons he batted .210 with 16 HRs & 64 RBIs. Retirement: After baseball he sold insurance in Greenwood, South Carolina where resided until his passing in May of 2013. In 2014 Calhoun Falls high school placed him in the schools Hall of Fame & the charter school named their baseball field named in his honor where he starred in the 1940's. In spring 1962, I thought Chrisley and some other fellows would make the club too. Ted Lepcio 3B and Evans Killeen P. they did not either.